Gernot Grömer (1975) holds a M.A. in astronomy, a Ph.D. in astrobiology from the University of Innsbruck and he is currently the President of the Austrian Space Forum. 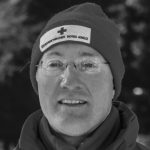 However, for students and alumni of the MA Program in Peace Studies at the University of Innsbruck, he is more familiar for his work with the Austrian Red Cross, where he has been training paramedics for twenty years and peace students for more than a decade.